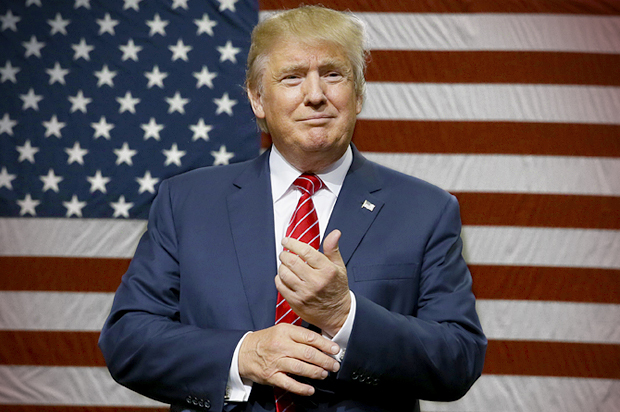 Across The Pond Wrestling: Opinion: Donald Trump and Wrestling - A Match Made in Heaven or Hell? Opinion: Donald Trump and Wrestling - A Match Made in Heaven or Hell? I can envisage a future where our world has been devastated and is almost beyond recognition: a few lone survivors hunt for scraps on a desolate Earth that has been ripped apart by warring superpowers. Most of civilisation as we know it has long since passed, decimated by The Greatest War of them all, the inevitable end result of the insatiable greed of nations governed by increasingly ruthless, bloody-minded demagogues. The only remnant of this era of distrust and fury are huge, golden statues, memorials to the cult of personality that led humanity down this dark path. In this bleak future, I see myself, tired and fraught, leading my children through the overgrown wilderness once known as New York. In the centre of the marshland, where the contaminated air is at its thickest, stands the golden statue of one Donald Trump, one of the agitators accused of stoking the fires of hate that caused the world to burn. My son looks at me: curious, confused, afraid. Reflecting on the complex turmoil of years past, I wonder how to answer him. I pause and respond. “He managed Bobby Lashley at Wrestlemania 23. He shaved Vince McMahon’s head and then Stone Cold beat him up”. Trump’s legacy in wrestling will always be tied to The Battle of the Billionaires. Playing the babyface to Vince McMahon’s classic heel, Trump made his presence felt on WWE television, questioning the direction and quality of the product following the infamous Donald Trump vs Rosie O’Donnell skit on Monday Night RAW (truly one of the worst segments in the history of the flagship show). As McMahon bristled at the sight of his rival, Trump dropped money on the audience (this could prove a crowd pleasing move worth revisiting when the presidency gets tough). 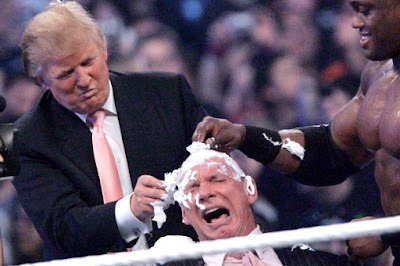 Weeks later, Trump returned to RAW and challenged Vince to a fight; despite being a former WWE champion who had beaten The Undertaker, Triple H and Steve Austin, Vince thought better of tangling with The Donald (sorry...Mr President) and instead suggested that they find surrogates to fight for them. With the added wager of hair vs hair, the main attraction of WrestleMania 23 was set. 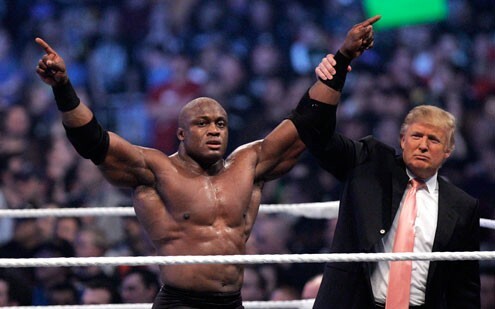 Trump was to give the rub to heavily pushed young star Bobby Lashley (although the rub was somewhat undermined by Trump referring to him as Bobby Lindsey in interviews) while Vince led "The Samoan Bulldozer" Umaga into battle. The match was okay, Vince had his head shaved in a memorable angle and Austin hit Trump with the worst stunner in history. Pause and reflect on that: "Stone Cold" Steve Austin has stone cold stunnered the President of the United States. The PPV buy rate was the best in WWE history at that time and Trump more than contributed to this. The character he cultivated in The Apprentice bore more than a passing resemblance to Mr. McMahon (they even shared the same catchphrase) and could be viewed as an equal: his composure on the mic and overly confident demeanour complemented Vince’s own style. Indeed, this run is probably justification enough for Trump to be considered worthy of his place in the celebrity wing of the WWE Hall of Fame. I was at the Garden the night that Trump was inducted. Whereas live crowds in 2007 had tended to cheer Donald (as they did during his brief return in 2009), by 2013 the tide had turned. Trump was booed viciously and I remember remarking to my brother that no-one on the roster had that level of heat. That is why Trump is so pro wrestling: he conjures strong reactions wherever he goes, reactions he often manipulates artfully. Like a political John Cena, you can either love him or hate him: to some he is a babyface, the people’s champion ready to save the working man from the cruelty of modern life; to others he is the ultimate heel, a conniving and corrupt individual of limited morality, consumed by greed and lust. However you feel, you do feel something: there are no shades of grey here. And that is wrestling at its most effective: Trump is a showman who knows what his audience wants and how to give it to them. He has Hulk Hogan levels of skill in reading a crowd and providing them with the perfect response at that precise moment: be it working them into a frenzy of hate and leading them in unified chants; tenderly raising a child in the air for a cheap pop; or showing rare humility as he did in his acceptance speech late last night. He even knows how to execute a turn: he switched from Republican to Democrat in 2001 and turned back again in 2009. Gotta keep that gimmick fresh. So now that the resident of the White House follows Vince McMahon on Twitter, can we expect to see politics and wrestling combine in the future? We can be sure that Trump will not go near a ring during his presidency and probably wouldn’t even return after his term is up. Trump is now too famous, too prestigious a catch for wrestling and for many, that, understandably, will be seen as no great loss. But Trump is already a part of WWE history. When you re-watch WrestleManias he is, as Vince attested in his HOF induction, ingrained in the fabric of many shows: the arena might be his own; he might be sitting front and centre at ringside; he might even be blowing Austin’s signature move. In the years to come, Donald Trump may well alter the course of American and World history, adding to his already complex and infamous legacy: he surely will be a topic in political studies for generations. But when the day eventually comes when my son asks me who he this man is, my response will start with Bobby Lashley.